In particular, I want to speak about Sweet Itch. Sweet Itch is an allergic reaction by horses to the saliva of the biting midge Culicoides. Previously prevalent in ponies in the northern hemisphere, Sweet Itch is becoming more and more widespread. This is what Sweet itch looks like. Culicoides is a blood-sucking midge found in wet, marshy areas or in dew or raindrops during the summer months. (It is also the insect that transmits AHS.) Once the horse is bitten, small intensely itchy lumps sometimes appear on the skin, usually along the horse’s back, belly, mane and tail. 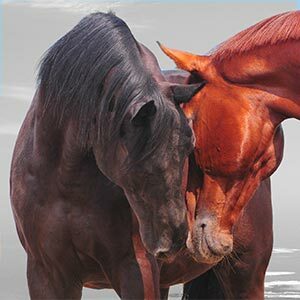 Because they are so itchy, the horse will often develop secondary skin eruptions and infections after vigorously rubbing or biting the itchy lumps. Why would my horse react to the bite, while other horses have no reaction? Your horse’s immune system is the army that is there to fight off infection. Which is very useful if he gets sick or cuts himself or something. The immune system works by first recognising the ‘intruder’ (aka the antigen, in scientific terms) as being foreign and dangerous. Then, it sends out soldiers to fight off the infection. One of the ‘soldiers’ sent out is called Immunoglobulin E (IgE). IgE causes mast cells to release histamine, which causes swelling, itchiness, discharge or wheezing. In an allergy, your horse’s immune system acts like an over-protective army (to continue the army analogy). This army over-reacts by sending out huge amounts of histamine even when the ‘intruder’ is harmless – a dust mite or the Culicoides bite or a component of food. Which results in the out of control itching, familiar to Sweet itch sufferers. What can I do, naturally, to help? Give a natural remedy which modulates the immune system – I suggest Immune mix from The Herbal Horse. Apple Cider Vinegar can be given internally (30 ml per day) as well as used as a rinse externally (2 tablespoons in a litre of water). Do not use the rinse if the lesions are rubbed open, as the vinegar will sting. On open lesions, apply an ointment containing calendula or propolis. A homeopathic remedy called Culicoides midge, made from the midge itself be helpful. Consult a homeopath to prescribe this. My horse has been behaving very strangly for a couple of months now and we have done various tests with the vet and cannot find what the problem is. He makes these funny head shacking/jerking movements and it is especially more when he eats his carrots or starts exercising. My vet is very baffled and cannot say what it is. My vet bill is sky high and we have still not found the problem. I saw your supplements at the tack shop and read up on the itch mix which I want to try and start using. I have changed my horses diet and taken him off all supplerments (GSC max, honeyvale products) and I must say there is a change. I am lost and not sure what to do anymore as I can see this causes him great discomfort and I only want the best for him. Christa, it’s a really difficult question and I am sure you’ve done your own googling. There are many possible reasons for the head shaking. (Here is an excellent article: http://www.ker.com/library/EquineReview/2003/HealthLine/HL21.pdf.) The cases where I know Itch mix has helped have mostly seasonal irritations. So probably worth a try, as it seems his symptoms started around Spring. But, if it is one of the other causes mentioned in the article, it might not help. But then maybe try some of the solutions suggested there. Best of luck with figuring it out.